"A Chinese take on the holiday roast turkey. The sauce is a sweet and spicy flavorful glaze on the crispy skin of the turkey with a hint of orange and cranberry. The whole red peppers with green onions on the side add a festive touch. The dressing is a savory rice dressing with cranberries and nuts. Sure to become a year-round favorite. 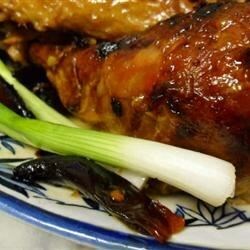 Garnish with whole dried red peppers and green onions along the side." Heat 3 tablespoons vegetable oil in a small skillet over medium heat. Toast dried red chiles in the hot oil until they turn dark red, about 2 minutes. Toss black pepper, 2 chopped green onions, light sesame oil, and 1 small chopped shallot into the hot oil; remove from heat. Blend cranberry sauce, turkey broth, soy sauce, orange juice, white vinegar, plum wine, ginger, garlic, and orange zest in a blender until smooth. Transfer to a bowl. Stir toasted red pepper mixture into glaze. Divide glaze in half. Place turkey into a large basting bag and pour half the glaze over the turkey and into the cavity. Seal the bag and refrigerate turkey overnight. Dissolve cornstarch in the remaining half of the glaze and refrigerate in a covered container. Remove turkey from marinade; discard the used marinade. Set turkey onto a rack inside a roasting pan. Mix white rice, wild rice, dried cranberries, walnuts, 2 small chopped green onions, 1 chopped shallot, and 1 tablespoon sesame oil in a bowl. Lightly stuff the turkey cavity with the rice mixture. Combine 1/3 cup vegetable oil with 1/3 cup sesame oil in a bowl and set aside. Roast turkey in the preheated oven, basting with vegetable and sesame oil mixture every 15 minutes, until skin is browned and crisp, about 2 hours. Stir reserved glaze containing cornstarch thoroughly and baste turkey every 15 minutes until glaze has baked onto turkey and an instant-read meat thermometer inserted into the thickest part of a thigh reads 165 degrees F (75 degrees C), 1 1/2 to 2 more hours. Watch Chef John bone, stuff, roll, and tie up a turkey. This recipe also lends itself well to whole chicken. General Tso (Zuo Zongtang, 1812-1885) was a military leader during the Qing dynasty. The spiciness of this dish is sure to release your inner warrior!